In the ever increasing trend to treat beer more like wine, there are now dozens of suggestions online for beer / food pairings. There are some serious and useful (don’t get me wrong, I like the food pairing stuff) graphics from places like craftbeer.com to help with this. As far as I can tell, the way to determine if a liquid and a food go together is to collect anecdotes, the lowest form of evidence from a scientific point-of-view. “Are people doing it currently? Does it make the two things taste better? Then it is a food pairing.” Not a very thoughtful way to determining something. I’ve been increasingly curious with why things taste good together. I’ve had discussions that do amount to “well I know better” about beer and food pairing, specifically about whether or not beer pairs well with spicy foods. I decided to look into it the way an academic would look into it. I don’t want to take anything away from people like Garret Oliver who wrote one of my favorite books on the subject or Greg Engert, owner of one of my favorite bars. While their opinions are useful and definitely valid, they ultimately boil down to a sort of “argument from authority”…I’m right because I know I’m right sort of thing. Also, advice is separate from measurement and science. I want to know the science behind taste perception, not just looking at peoples advice. There are a dozen blogs on my feed filled with beer / food recipes that are full of good advice. To my pleasant surprise, there is some actual science behind food pairing and some people doing legitimate work to discover not only WHAT foods go together but WHY foods go together. It turns out that food pairing is studied scientifically and one of the leading hypotheses about how to pair foods is to look at what aroma/flavor chemicals are shared between the two substances. On the surface it makes sense in a “why didn’t I think of that” sort of way. Like goes with like, but more at the chemical level. Pairing two foods that have the same chemical make-up, or the same array of flavor-active compounds, might enhance the flavors, it makes sense at least. What does this observation means for “beer” as a food product. Obviously, beer is a complicated food product. Beer is a beverage that combines the flavors of primary beer ingredients (malt, water, hops, and yeast) as well as what other spice or adjunct you added to the beer during or after fermentation (coriander, citrus, juices, fruits, honeys, etc). On top of this complexity there are more than 100 different KINDS of beer, and the flavor components of those different styles of beers will obviously affect the flavor and therefore the pairing. So I was poking around on the internet the other day and came across this article from 2011. I thought it was interesting enough to summarize and elaborate on it here. The authors of the article built an impressive database of flavor/aroma active chemicals and assigned them to different foods, then drew association maps between different food products and showed that foods that shared more chemicals were classically considered to be paired together. Is this definitive? No, absolutely not, but it is a fascinating way to look at food. The basic premise of the article is that chemicals form groups based on what flavor sensations they evoke within your sensory system, chemicals that are similar or the same will generate similar perceptions and so they will pair together. 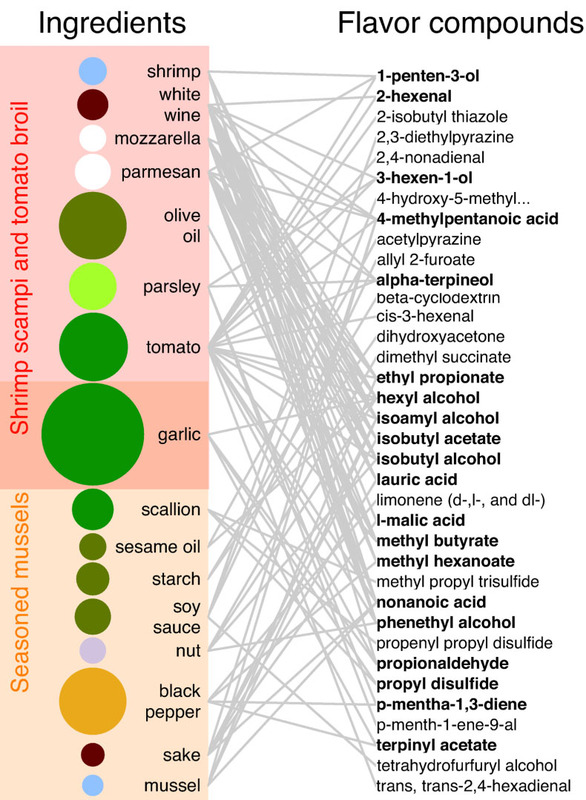 The graphic belwo shows what chemicals are shared in a dish of mussels with a tomato sauce. There are dozens of shared chemical components with taste consequences. “Cool, you just told me why spaghetti sauce tastes good….neat…” OK OK, this is a BEER blog. Let’s talk about beer. I’ve touched on some of the chemicals that affect flavors that are produced during a normal fermentation with Saccharomyces species and with Lactobacillus species. But those posts focused primarily on what flavors the yeast or bacteria itself produces, not what flavors the hops or the malts would produce independent of the fermentation. I was curious what flavor compounds were used in this analysis since “beer” was included in the food products. To a beer snob like myself, calling something “beer” raises a lot of questions. It is sort of like calling a food “cheese”…well it’s a place to start but a pilsner and a stout are both beer and both chemically distinct not to even mention mixed fermentation beers that will contain lactic acid as a major product. 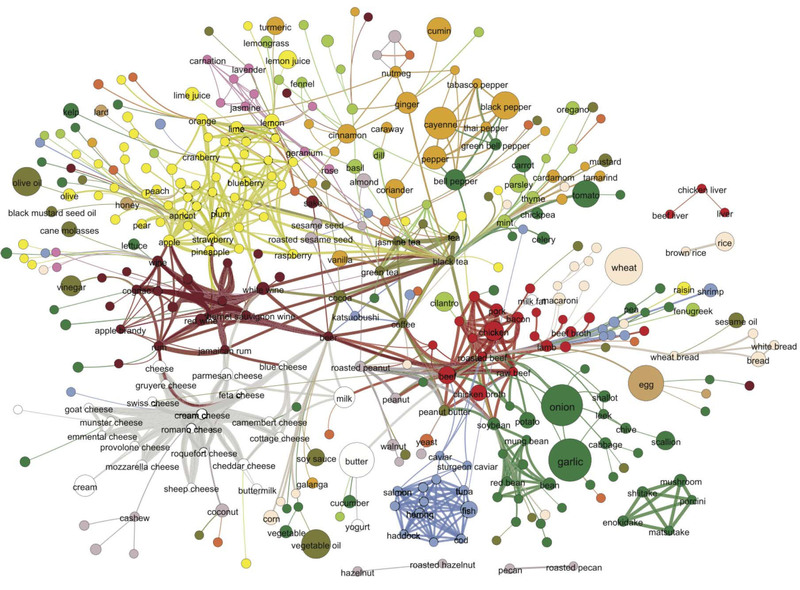 “Beer”….I left a table at the end of this document with the 229 compounds found in beer (a pale ale) used to make this network of flavor interactions (there were a total of 1106 compounds in the database used) . That is a busy graphic and hard to read but allow me to summarize it for you. Beer shared at least one compound with 948 different food products (out of 1532 food products in the database). Their analysis of shared compounds between beer and their panel revealed that beer had the most in common with the following Blue Cheese, Cheddar Cheese, Swiss cheese, Gruyere cheese, Beef, Apple, Pork, Liver, Katsuobushi, Milk, Roast, Beef, Coffee, Corn, Cocoa, Galanga, Soy Sauce, Watercress, and Rutabaga. Some of these are not surprising. Really quick, Katsuobushi is dried fermented tuna. I had never heard of it, perhaps I should get out more. Without lumping or editing their database, I pulled out the top 75 hits for “beer” and flavor pairings, table below. There are definitely themes in this list. Such as….wine, beef, tea, and cheese. Also known as the best foods. So not surprising, there are a lot of fermented foods on that list. A lot. What are the flavor chemicals that are driving those interactions exactly? Well, there are several chemicals that appear in dairy, meat, and beer products. The chemicals driving this interaction include o-cresol, 2-butanone, propyl acetate, ethyl lactate, decanoic acid, isoamyl laurate, pyrazine, phenethylamine, thiazole, indole, pyrrolidine, 3-hydroxy-2-pentanone, 2-hepten-4-one, ethyl isovalerate, propyl acetate, n-valeraldehyde, methyl acetate, and guaiacol. Looking at a list of chemicals like that makes you wonder how these lists were made and if they are weighted at all. I traded emails with the authors of the paper and as far as I can tell, the different chemicals were not weighted (or were weighted the same if you prefer) and the lists were populated from the literature and a couple of books that contained lists of compounds found in food products. If you like beer, eat chicken, beef, pork, and dairy products is the bottom line. Also tea…I’m fine with all of that. This sort of analysis is a deep rabbit hole. There are a lot of limitations to this sort of thinking and analysis, most notably is you are limited by what compounds you include in the initial analysis and I was initially surprised that ethanol was not on their list (especially since even without it all the alcoholic beverages still clustered together). Ethanol definitely has a flavor and would influence this sort of analysis as well as people’s taste preferences but I understand how that is such a huge contributor that you might not want it in the analysis. It would also affect the solubility of other chemicals that would have flavors…enhancing those. Second, what foods you select are going to bias your analysis. In this respect I think the authors did an amazing job selecting a variety of foods from several cultures that hit several “areas” of food. At times I found the list a little redundant but I should never judge their database building. It would be great to have a database that was 10 or 100x larger though, then you could really do some detailed analysis. Lastly, there wasn’t a serious effort to take into consideration the overall contribution each flavor compound had on the individual food or drink item. The threshold for different taste chemicals would be different and the overall taste detection would be dependent on the concentration of each compound. This would be really hard to do though and I recognize that. Also, it might be misleading as lots of things that do pair do NOT share a compound that is dominant in one of the ingredients. It would be pretty hard to parse that sort of data in a meaningful way. Like I said above, it would be interesting to do this with a few different kinds of beers. I didn’t include it in the analysis for a couple of reasons but the authors included a second beer they labeled as “bantu beer”…I did not include it in the analysis above because it was so close to the generic beer, they shared the greatest number of compounds of ANY TWO entries in the entire database at 227, grilled beef and roast beef were second at 207 shared compounds. Bantu beer and beer were nearly interchangeable in this analysis, often appearing side-by-side in the cells of the spreadsheet. In fact, the primary difference between the two beers on their list came down to the presence of three simple compounds in the bantu beer not listed in the “beer”: ethylene oxide, methyl myristate, and 1-phenyl-1-propanol. I’m not sure why those compounds were listed with bantu beer and not with the generic beer but perhaps they are present due to the sorghum used in the fermentation. Who knows? Not me. It would be fun to do a stout versus a pale ale or a lager versus an ale though. Perhaps if I have a bottomless pit of time I will do that analysis one day. Supplemental Information. List of compounds found in beer used for the matching. Did they assess whether or not these compounds were above threshold or not? The info is kind of useless for below threshold sensory compounds. It’s noise. More interesting to compare quantitative data that is above a qualitative threshold, to the compare lager to stout to blur cheese to roast beef. Supposedly, the lists were compounds that were above the threshold but I touched on that concern in my wrap up. Obviously taking into consideration the different concentrations would be better but far more difficult to do. Definitely. Need to get one of those electronic noses on this. I really like all of the questions that the referenced study raises. It would seem that there is a database out there of various flavor and aroma compounds in foods, and at what quantity. If a flavor threshold was assigned to each compound, a more meaningful relationship could be found. This doesn’t sound ridiculously difficult, but it assumes said data exists. Of course, there are a lot of other factors at play, such as which grouping of flavors work best together, factoring in customary ingredients (salt on eggs, rosemary on a roast) and textures (carbonation, viscocity, creaminess, etc.) that are often part of the experience with each food item, as well as how compounds are perceived at various levels, but it would be a decent starting ground. It seems like this kind of approach could also help to come up with new ideas for beer adjuncts. I’m not sure how you’d do a cheese or beef beer, but coffee is already popular and I’ve made a galangal ale before that was really good. I’ve seen very few beers that use tea as an adjunct, so that seems like an area ripe for experimentation.